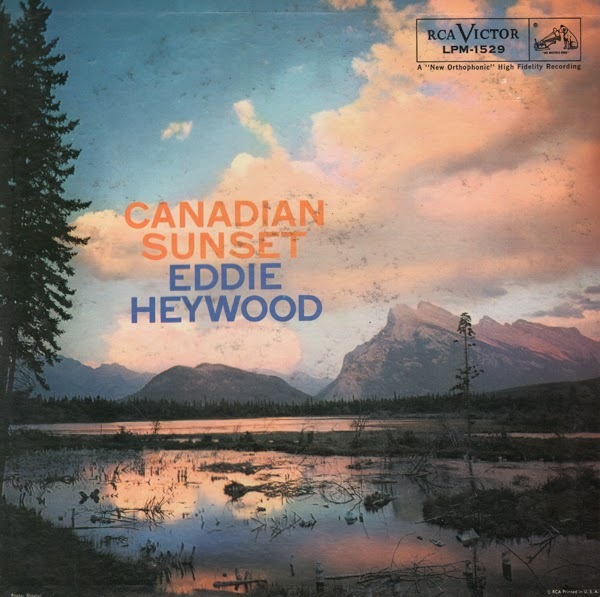 From the back cover: Success as a composer marks the third time that Eddie Heywood has hit the jackpot. He first gained renown in the early 1940s as the leader of a witty, stylized and stunningly rhythmic little band. He was riding the crest with his band in 1947 when he was hit by as hard a blow as a pianist can face – partial paralysis of his hands. 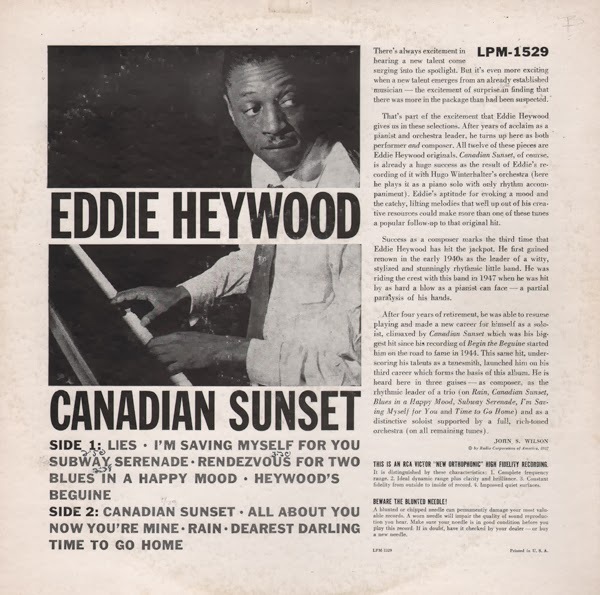 After four years of retirement, he was able to resume playing and made a new career for himself as a soloist, climaxed by Canadian Sunset which was his biggest hit since his recording of Begin The Beguine started him on the road to fame in 1944. 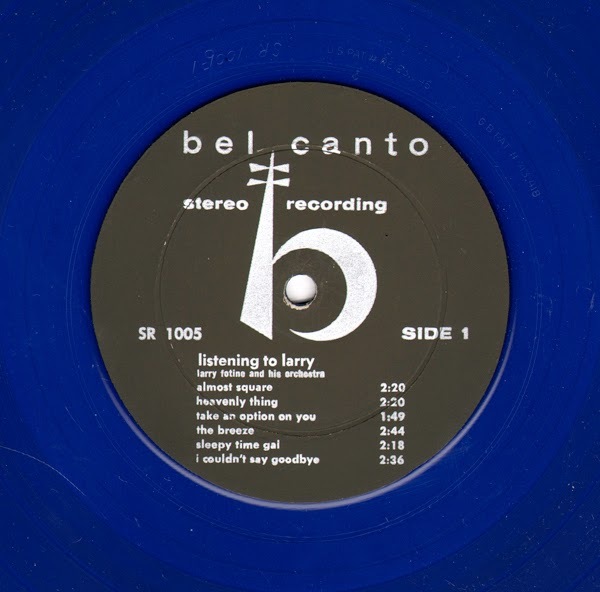 Originally priced by Bel Canto at $5.95, I paid little more than that at one of my record store stops to collect the sophisticated cheesecake art and blue vinyl disc. 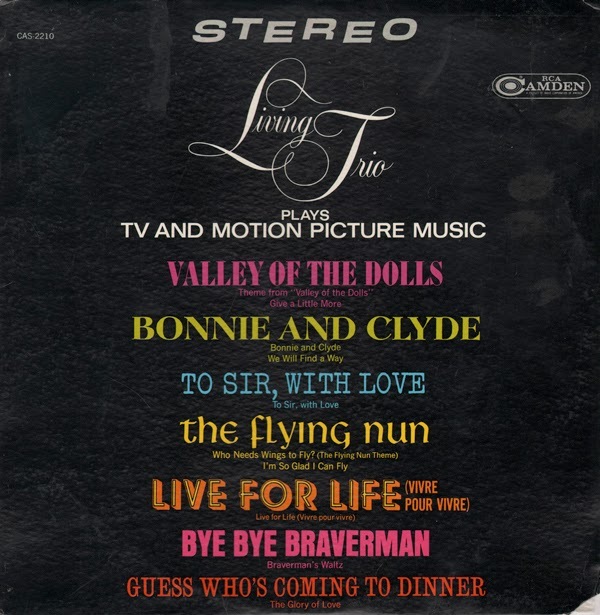 After reading the jacket notes, I was afraid that the tracks would sound too "Lawrence Welk". Yes… the music is "old fashion" sounding" compared to the slick period marketing vibe of the packaging. Tracks are available at your usual online outlets, so I will not be posting a sample here. From the back cover: Who was behind the scenes of Lawrence Welk's spectacular rise to success out there in Television-Land? One of the names that has to go on the list is Larry Fotine's, who arranged for Welk from 1955 until 1957, when Lick Pier has no peer as a magnet for the millions who hunger for music to dance by. In this album, Larry Fotine and his Golden Thirteen give you an even dozen all-time favorites, including a smattering of Fotine's original compositions. 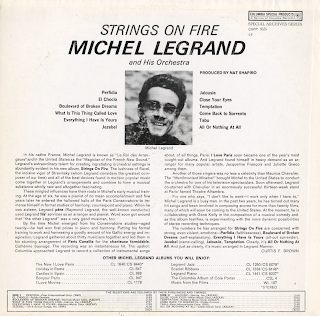 From the back cover: In his native France, Michel Legrand is known as "Le Roi des Arrangeurs" and in the United States as the "Magician of the French New Sound." 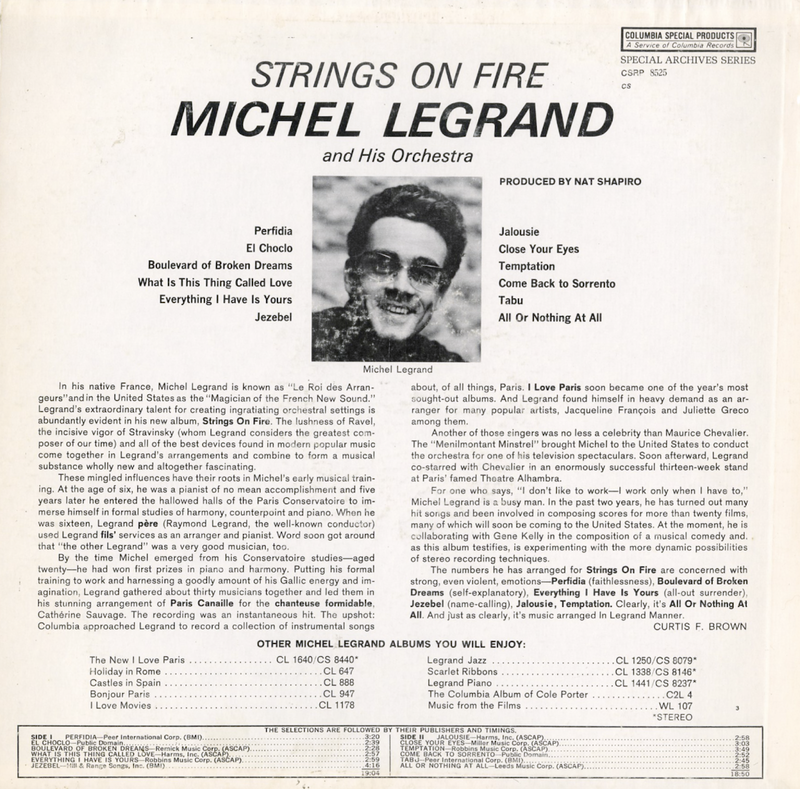 Legrand's extraordinary talent for creating ingratiating orchestral settings is abundantly evident in his new album, Strings On Fire. The lushness of Ravel, the incisive vigor of Stravinshy (whom Legrand considers the greatest composer of our time) and all the best devices found in modern popular music come together in Legrand's arrangements and combine to form a musical substance wholly new and altogether fascinating. These mingled influences have their roots in Michel's early musical training. At the age of six, he was a pianist of no mean accomplishment and five years later he entered the hallowed halls of the Paris Conservatory to immerse himself in formal studies of harmony, counterpoint and piano. When he was sixteen, Legrand pere (Raymond Legrand, the well-known conductor) used Legrand fils' services as an arranger and pianist. 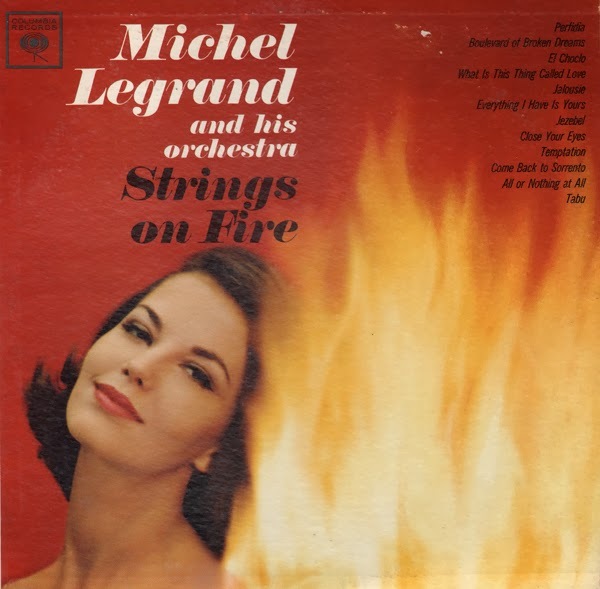 Word soon got around that "the other Legrand" was a very good musician, too. By the time Michel emerged from his Conservatory studies – aged twenty – he has won first prizes in piano and harmony. Putting his formal training to work and harnessing a goodly amount of his Gallic energy and imagination, Legrand gathered about thirty musicians together and led them in his stunning arrangement of Paris Canaille for the chanteuse formidable, Catherine Sauvage. 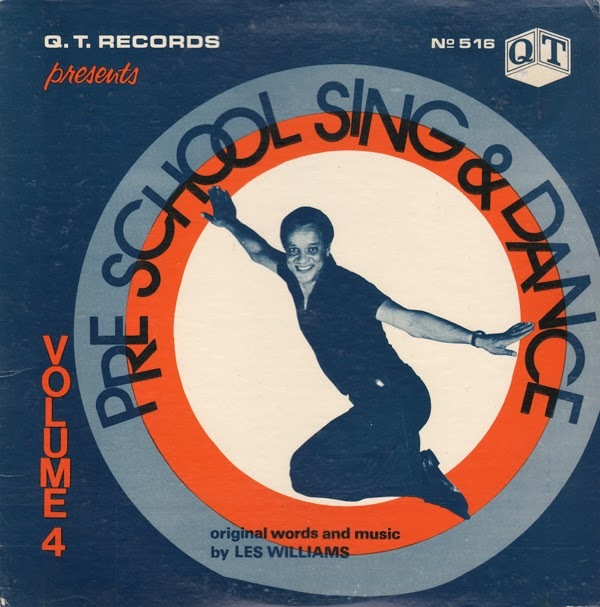 The recording was an instantaneous hit. 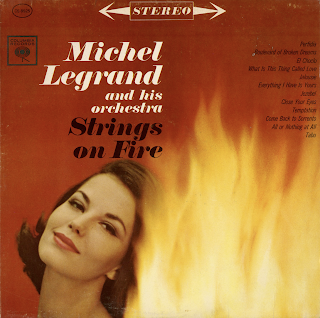 The upshot; Columbia approached Legrand to record a collection of instrumental songs about, of all things, Paris. I Love Paris soon became one of the year's most sought-out albums. And Legrand found himself in heavy demand as an arranger for many popular artists, Jacqueline Francois and Juliette Greco among them. From the back cover: Paul Whiteman proved that he was a good judge of talent when he recommended Eddie Ballantine as a radio network staff musician back in 1931, for Eddie has been sending music out over the air waves ever since. When Breakfast Club was born on June 23, 1933, Eddie Ballantine was playing trumpet in our band of which he is now the director. I guess that 26 years of close daily association gives me the right to speak my piece about this fine musician who is also a mighty fine guy. 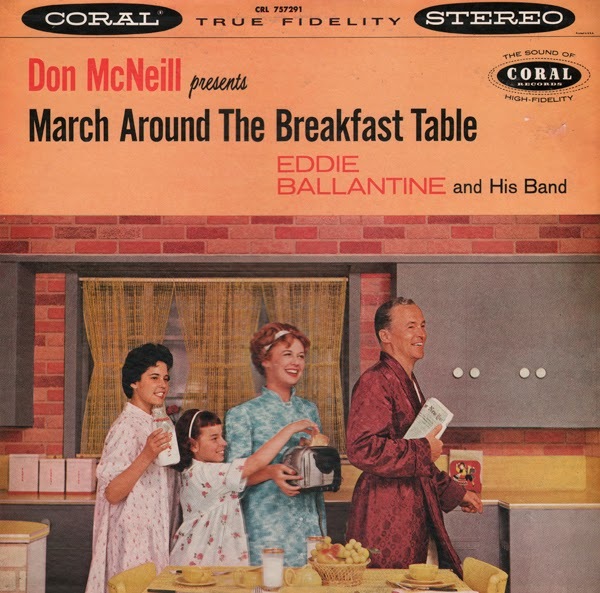 Many thousands more are still growing up marching around the breakfast table to the music of Eddie Ballantine's Band. If, as the old saying goes, everyone loves a band, then the ones who listened to Ballantine's Band are mighty lucky because we think it's the best. I hope this wonderful album of marches will find a spot in your heart as warm and tender as our is for Ballantine and the music he delivers. 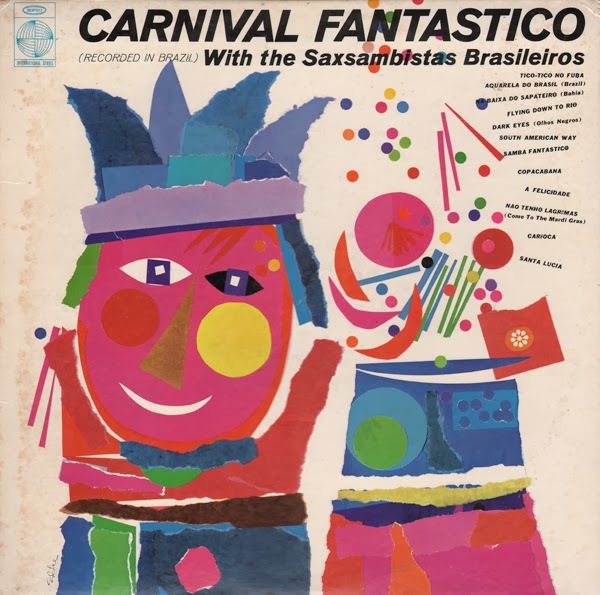 Nice light pop space age Latin featuring no jacket information on The Saxsambistas Brasileiros. From the back cover: Music for the teenager and the "now" generation has never been attempted by military bands. There is a need for it, not only for the cadet's here at the Air Force Academy, but also for the young fighting man serving in the armed forces today. 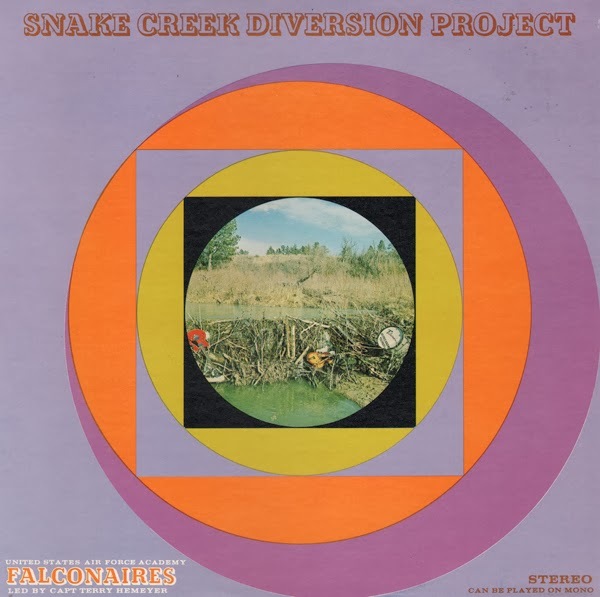 The "Falconaires" (Snake Creek Diversion Project) have become apart of the current scene musically, by playing up-to-date sounds for the cadets at their social functions and for servicemen overseas by way of the Armed Forces Radio Network. On this album, the "Falconaires" present an entertainment spectrum that we hope will create a greater public understanding of the military and of the Air Force Academy. From the back cover: Les Williams: A most versatile dancer and teacher has devoted a lifetime to dance. Interrupted only when he served Uncle Sam in World War Two as a bombardier. Les lectures in numerous colleges throughout the United States on American Dance. He has toured the country from coast to coast with Dance Caravan and has operated his own very successful dance studio in California for many years.